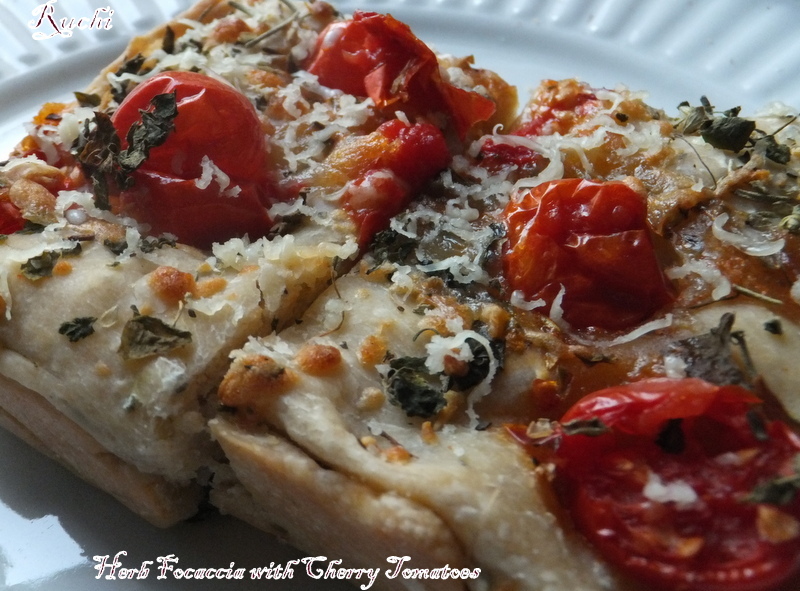 Focaccia is a flat, chewy Italian bread that tastes wonderful with added herbs and toppings.. 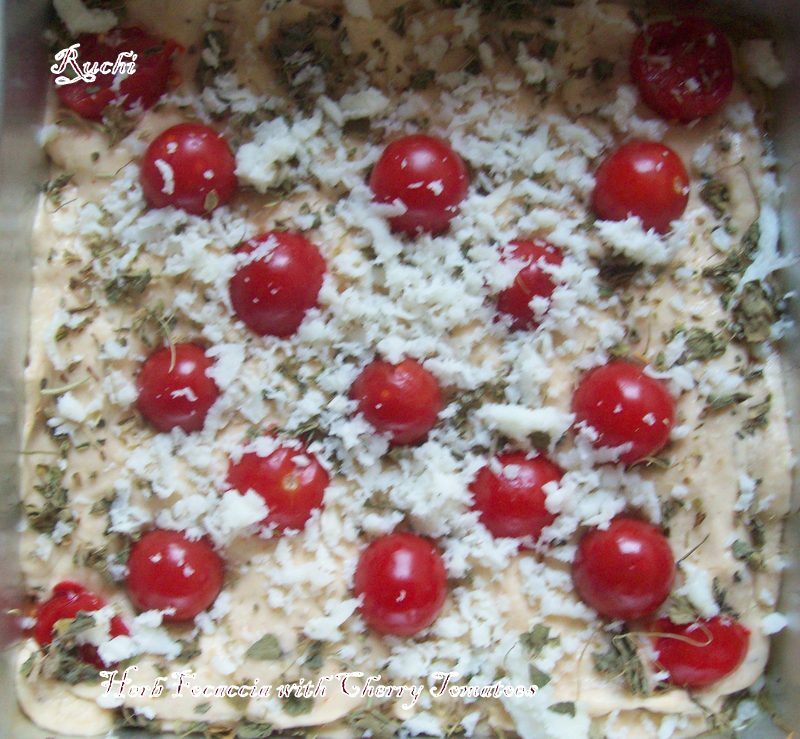 It tastes simply delicious, the cheese adding a savory note and the cherry tomatoes providing a perfect foil to the olive oil infused bread. I was searching in Google for bread recipes and this Italian bread caught all my attention due to the addition of herbs. This bread can be adjusted according to your taste. In authentic recipe they use Italian herbs (basil, Thyme, oregano, rosemary). I had only oregano, thyme and mixed spices at home., so I made few variations in topping by mixing kasuri methi,herbs and cheese. This is the first time I have made bread from the scratch, although I’m not of a bread baking expert yet but My First Attempt of this bread really turned out great and gorgeous looking. My First Attempt of making Bread-Tried & Tasted! 1. Microwave the water in a microwave safe bowl for 30 seconds. Add the sugar and stir until dissolved. Sprinkle the dry yeast over the water and stir vigorously till it somewhat dissolves and becomes a pasty texture. Cover and keep aside for 10 Minutes. .
2. After 10 minutes when it has frothed add 3 tbsp of olive oil, mix gently and keep aside. 3. In a big mixing bowl tip in flour, salt, red chilli powder, pepper powder ,Italian seasoning, finely chopped garlic and mix well with your finger tips. 4. Add the developed yeast solution and bring everything together till they form into a dough. Knead for 8-10 minutes till the dough is smooth to the touch. 5. Smear olive oil all over the dough and place it in a greased bowl, cover with a damp towel or cling wrap and let it rest for 1-2 hours or till it doubles in a warm place. 6. Punch the dough to release the air and place the dough in a greased baking tin. Cover and let it once more rest for another 1/2 hour. 7. Make a few dimples on top the dough’s surface with your finger. 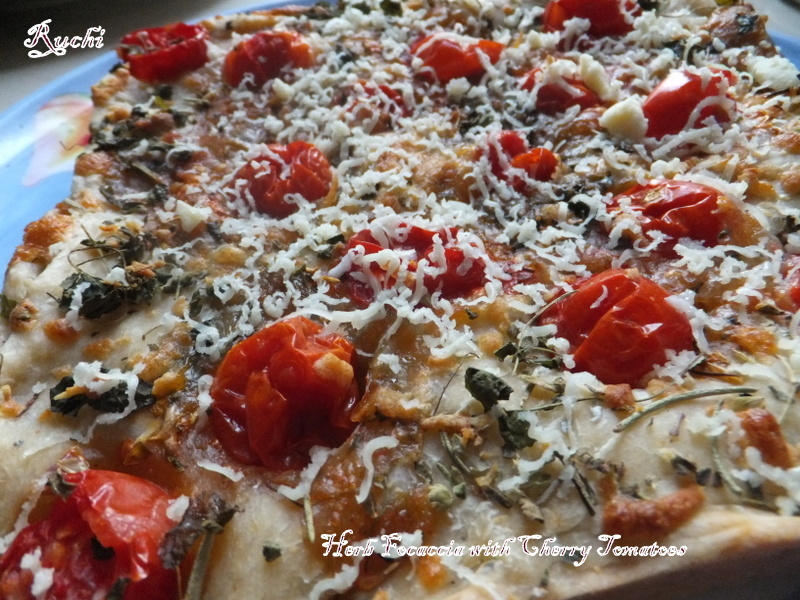 Brush the top with olive oil and top with cherry tomatoes, Kasuri methi, herbs & cheese. 8. Bake in a pre heated oven 180 Deg Celsius for 30 minutes or till the top becomes golden brown. 10. Cool for 5 minutes. Slice and serve hot with tomato sauce. 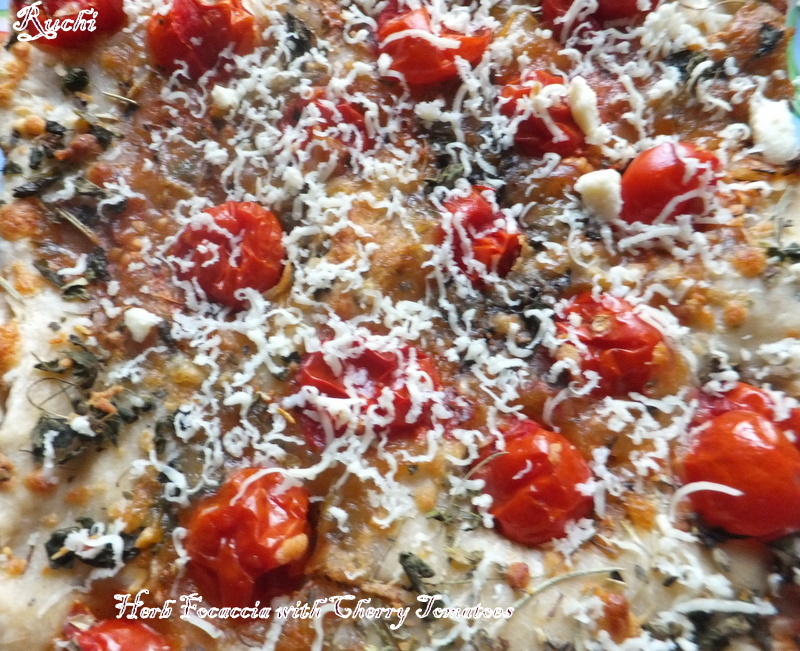 Wow with those cherry tomatoes,focaccia looks mindblowing Akka.